Fireworks: For my Son and others. This panel, made by a mother for her son, is dedicated to all mothers who have lost sons in the AIDS epidemic. It was inspired by her son’s love of fireworks and it celebrates all the bright, colourful and sparkling aspects of his life. But she says it is also for her because there is no grave site or plaque for his ashes. This panel is his memorial. His mother tells a story that has become a family legend. “When he was a little boy – he was very small – he had a little grey suitcase and we gave him all his fireworks to put in his suitcase – not the rockets – all the little fizzies and things – those little cartwheels and cathrine wheels. He really wanted to let one off himself. He’d never let a firework off, so his father said, “Oh well, I’ll light one for you, but the minute I light it you are to throw it. He said you are not to stand and hold it because the flames could injure your hands.’ So he did as he was told and threw it the moment it was lit – right into the suitcase full of fireworks.” His mother describes her young son’s tears when he realised what had happened, and his little skinny legs hopping up and down amongst the bangers and cathrine wheels. “Oh, it was sad really. But we laughed and laughed. He didn’t, He was devastated. He had carried his treasure around for days and they all went up in one go.” What he had so looked forward to ended up far too soon. Looking back now this seems to be a symbol for his own life. Aquamarine coloured Dupion Silk was chosen for the background. His mother said her son loved luxury things and this piece of silk was also the colour of the only brand new car her son had ever bought. The colour also represents the sea which he loved. A 9cm x 2.5cm padded, red, satin skyrocket bound with purple and gold braid zooms across the top of the panel, exploding into jets of iridescent colour. A long white cord trails out behind the rocket suggesting that it has already travelled as high as it can go. On the bottom portion of the panel, a ‘sparkler’ sends out showers of glittering sparks. Hundreds of glass beads and star-shaped sequins in multi colours have been hand stitched to the fabric in order to achieve this effect. 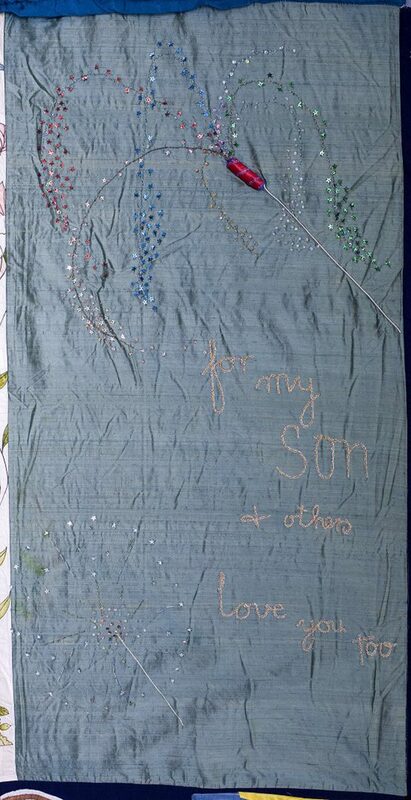 The words, ‘for my son and others’ are written in silver coloured cord across the central portion of the quilt. The largest and most predominant word is ‘son’. Beneath this the words, “Love you too” appear. This is what mother and son used to say to each other whenever they said goodbye, whether it was after a visit or at the end of a telephone call. Her son loved travelling and his mother is comforted by the thought that his quilt panel will continue to travel around with all the other quilts as part of the fabric of life in New Zealand.